Sometimes, it happens to me out of the blue: the sudden urge to get messy and bake something. I'll be minding my own business when the urge arises to get up to my elbows in flour, creaming butter and sugar, measuring, tasting. To have the flat filled with the smell of something delicious just coming to life in the warm belly of my friend, the oven. Always baking, this self renewing compulsion, usually late at night. If only these urges came as strongly with laundry and exercise, I might be all set. Yesterday, it was 1:30AM when I decided that I would try and proof some dough overnight to bake it in the morning. Fresh bread on a Saturday morning? YES PLEASE. There was only one problem: I had no milk, and only about a 1 1/2 tsp of yeast, nowhere near a regular amount to make a decent, quick bread. So I used Julia Child's White Bread Recipe, which contained no milk, but instead, made use of butter, naturally. Julia was notoriously wonderful at finding ways to put butter in EVERYTHING. After some quick Googling, I discovered that you can actually use LESS yeast in a recipe a long as you give it a longer rise time. Perfect for someone who plans on sleeping in between making and baking, non? I unfortunately did NOT take pictures of the process, because half of me was very convinced that there was going to be a disaster, and also, it was 2AM by the time I got started. I have never messed with the yeast proportions in a recipe before, or let dough chill in the fridge overnight for a slow rise. I was nervous the cold would wipe out the yeast like a snowstorm and some unsuspecting villagers. Cut me some slack, or at least a slice. 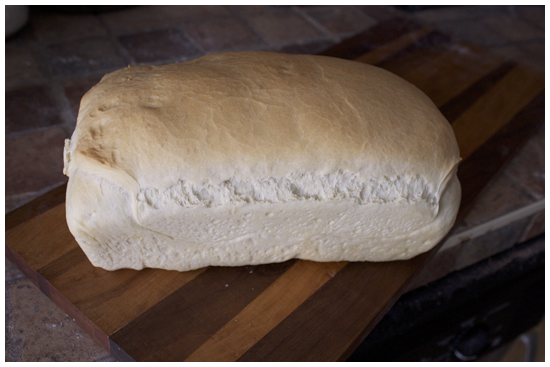 I did take some pictures of the beautiful after bake though. I probably could have left it a little longer in the oven but... I'm not unhappy with how this loaf turned out. I got up in the morning to put this thing together, and now I can't stop eating it. 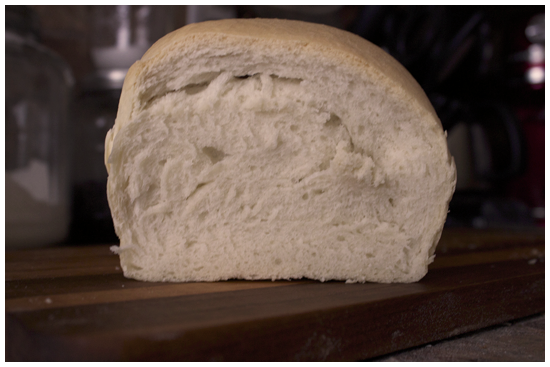 You can see a pocket/slice of air in the top, which I think could have been fixed in forming the actual loaf. But even imperfect homemade bread is one THOUSAND times tastier than the bagged, store bought Wonderbread you're thinking about right now. It's soft. Chewy. Moist. Buttery. The crust is crisp in contrast to the warm airy inside.